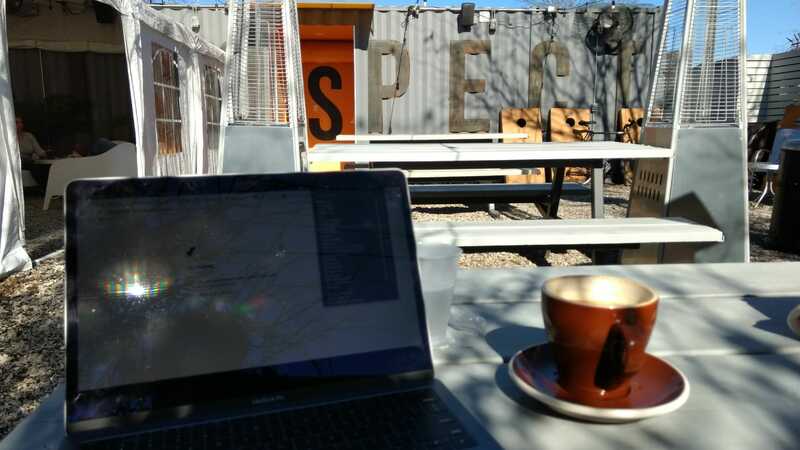 While I was enjoying the most hipster Saturday afternoon, in an old gas station refurbished into a coffee shop named Retrospect, I thought the name was appropriate to write a short review of the past year. I thought this would be an interesting writing exercise. 2018 started from the side of a bridge in Vienna, as we were watching one of the old world capitals engulfed in fireworks, Sara and I, had a few big things planned for this year. The two big highlights of 2018 were: first, our three week trip to Japan in the heart of winter and second, the start of a new Postdoc position in Houston, Texas. Our Japan trip was an extraordinary adventure, you can find some excerpts of the trip on Sara’s blog here, while I will spend more time going over the new Postdoc position in Houston. My postdoc in Houston started in March, we packed our life once again in a few boxes and hopped on a plane to a whole list of new things to experience on both the personal and work side. If you are new here, my new position is to study host-bacteria associations within the microbiome of the nematode Caenorhabditis elegans. Before that, I was studying ectosymbiotic bacteria associated with deep-sea invertebrates such as shrimp (Rimicaris) or mussels (Bathymodiolus). One of the biggest joys, and also frustrations, when you work with deep-sea invertebrates is the mapping of uncharted territories. Sequencing new bacteria often reveals a lot of new “unknowns”. Those unknowns are or could be, genes, protein mechanisms, regulation functions etc… that might be something cool, but they are extremely difficult to investigate. Any of those new unknowns belong to a fragile system that you can’t keep (yet) in the laboratory, and even taking it out of its deep-sea environment can immediately kill or deeply alter the animal’s physiology. You can tell me that it is part of the job to figure out how to get over those obstacles, and we had some ideas and successes. For example instead of traumatizing a mussel with a pressure shock, what about reverse engineer a blender to place it on an apparatus operated by an ROV and blend the sample directly at the bottom of the sea? Or try to keep the few ones alive as long as possible and try to figure out how to keep them happy! Actually, a laboratory in Kiel, Germany, kept some deep sea mussel happy for several years. On the other side, there is C. elegans. A worm over-studied for the past 40-50 years and yet until very recently, nobody really looked at its ecology and associated microbiota. Very little is know about the microbiota, except that there is one. The nematodes host bacterial communities, the composition of which depends on the environment. 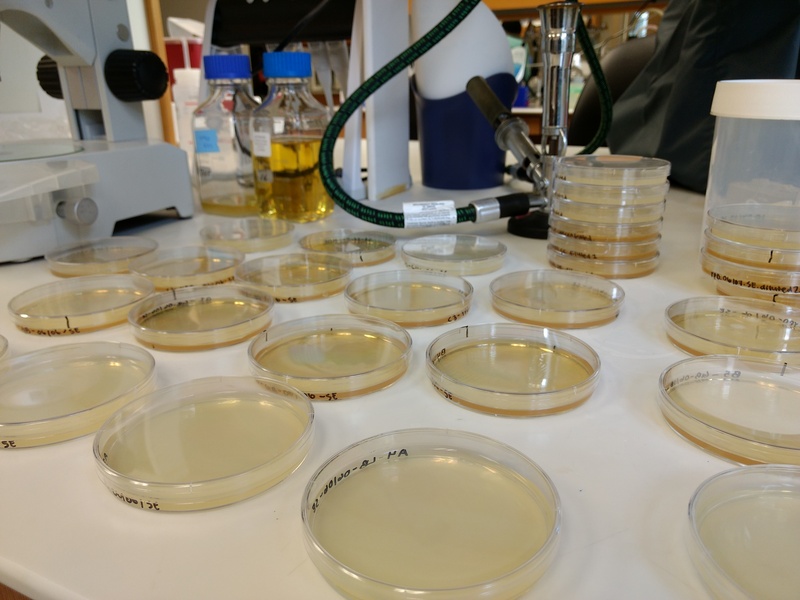 From those studies, we have access to a large collection of bacteria isolated from wild C. elegans, each one available in pure culture. This is an experimental sandbox dream, we have at our disposal a system that you can tweak on both sides: if we have plenty of bacteria we also have hundreds of C. elegans strains isolated from the wild, each one with a natural genome variation. This is a perfect setup to investigate what are the bacterial elements necessary to assemble a microbiome and how natural variation in host population affect it. You can check the effect of single or a whole complex batches of genes (host or bacteria) in low to high throughput fashion. This is what drove me to this new system, if you find something in the genome you have a whole system to play with. Now if this is the perfect system, it comes with a new set of annoying/stressing things. When I was working with frozen samples from the deep-sea I had little to worry about on the lab side. Extract DNA, don’t be too much of a slob, sequence, analyze and turn mad at the computer. Now it’s a new challenge, the biggest one is timing and logistics. Get your worm ready in time for an egg prep (in brief a way to have a synchronized C. elegans population), get your bacteria growing a few days ahead, get everyone together and hope for the best, then turn mad at the computer (some things don’t change!). And contamination can happen quickly, so get a sample of those bacteria before the experiment to be sure you have the right ones. But when everything works it is extremely satisfying! Aside from the new topics, I also had the opportunity to mentor a few students this year. This was something I lacked during my time in Bremen and I was happy to be able to patch this up now. I had three students working with me this year. Two high school students, who decided to investigate the effect of Kombucha (fermented tea) on the gut microbiome and enrolled staff from their school into a microbiome study. This was an exciting and weird summer. The third was an undergrad student who was doing a rotation with us. Together we went through all the imaginable issues of doing something new in the lab. Ultimately, even if there were only limited results, it helped greatly for the next step of the project. Overall those first concrete teaching experiences were very rich in lessons (for me at least, I hope all the students liked it). The only downside for me was that it took a huge chunk of my time, during my very first mentoring time back in Bremen I felt like I didn’t spend enough time with the student, leaving her to do a lot by herself. Somehow I did try to compensate (or overcompensate) it with those two new opportunities and it took a small tole on how my other projects went further. This is a balance I am still trying to learn. This being said, this year I had a lot of opportunities to sharpen some old skills and learn new ones. I had the chance to attend the JGI Microbial Genomic & Metagenomic workshop. It was a very good refresher/update/source of new learnings on genomic topics. It was a one week workshop covering the latest basics on genomics and how to use IMG, the JGI’s genome analysis web platform. There is so much potential there, waiting to be exploited into fascinating data analysis projects. I would highly recommend attending this workshop if you want a good introduction to the world of genomics or if you will work a lot with the IMG platform. So many Petri dishes this year! This year I wrote my first grant! Being on a Marie Curie International Training Network program at a Max Planck Institute is not really the best place to learn how to write such things. I was extremely lucky for my Ph.D. where money never was an issue, this is a great golden cage, you can do the best science possible while not worrying (too much) about the immediate future. Now, this is behind me and I am back to reality where writing grants is the key to success. I tried my luck this year with the HFSP postdoctoral grant, even if it doesn’t go through it was a very enriching experience that helped me a lot to settle the foundations of my current postdoctoral projects. Fingers crossed! Ego brushing aside, I realized that there are only a few posts between this year’s Microbial Advent Calendar and the one from last year. This is something I really would like to correct over the next year. I have a few ideas of short (and not so short) tutorials to write, just need to find the time… I am still looking for the ultimate blog post series, which would combine cool data analysis, bacteria and not being too time-consuming. I’ll let you know what happens!